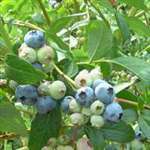 A vigorous, upright plant producing firm, dark blue fruit with a good, rich flavour that is sweet, but tangy. The fruit ripens during July, a little after the earliest varieties, and slightly before the main mid-season ones. Spartan is late-flowering, so can avoid damage from late frosts, but requires cross-pollination for best yields, so grow along side a different variety. Performs best on well-drained soils, and has some resistance to the fungal disease 'Mummy Berry'. An open, upright habit, canes can need "topping" in the growing season to encourage branching. I received my order well packed and as described. All the plants look healthy and give promise of future healthy grow. Completely satisfied with my purchase. Many thanks. I am delighted with the blueberry bush you sent to my wife and I. I was hugely impressed with the packaging. It took a while to get into it but all very worthwhile, the plant was in perfect condition. I wish other mail order companies took such care. Many thanks. Really thrilled with my blueberry plant, which arrived in perfect condition, with very thorough protection, from gardeners who love their plants and customers, thank you. Impressed both by plant quality and also by the excellent packaging which meant there was no damage to the plants. I was very impressed by this website. I received an email from Trehane Nursery informing me that the plant was to be delivered the next day. The next day the item arrived in the best condition of any plant I've ever ordered from a website. I will definitely be using Trehane Nursery again and would highly recommend.